Last week, I had the pleasure — nay, the privilege — of guest hosting my very favorite Twitter chat. 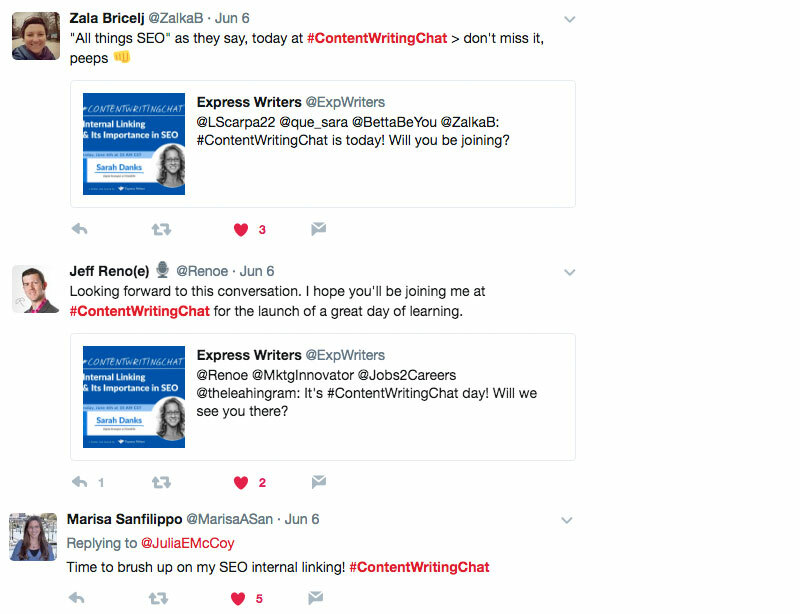 #ContentWritingChat is the brainchild of Express Writers, and began its life with a few dedicated souls gathering every Tuesday morning to talk about content. It has since burgeoned into a respectable, well-attended chat chock-full of great-minded people, thoughtful marketing insights and wonderful guests. Hopefully I held up to the high standards everyone has come to expect on this awesome chat! For my topic, I chose to talk about the importance of internal links in search engine optimization. Considering I’ve been in the SEO world for 12 years this is a topic near and dear to my heart, not just because I consider it to be a crucial part of search, but because, well, search engines do, too. 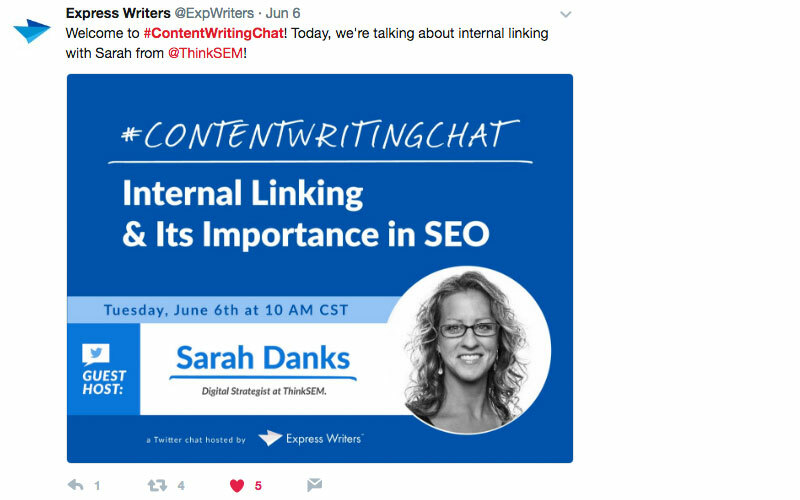 As the morning of the chat grew nearer, I became really excited to be chatting with all these smart minds about internal links! 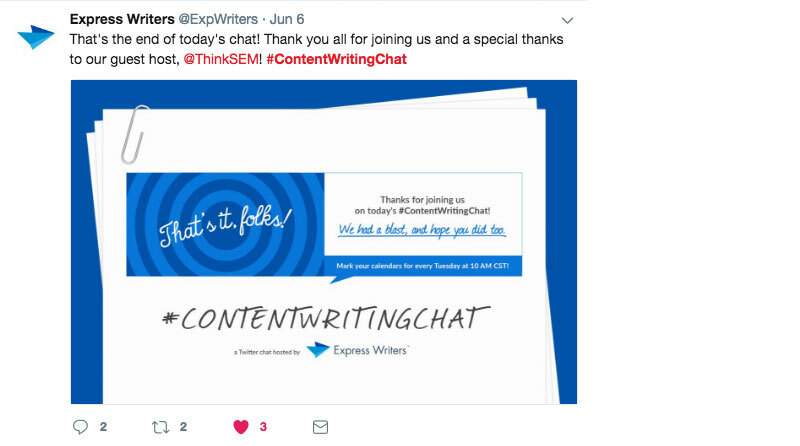 The folks over at Express Writers do a bang-up job of welcoming everyone to the chat, calling out greetings to everyone, and in general just making #ContentWritingChat a great place to be. In fact, this community of chatters is so loyal that even those who can’t attend will give a shout-out — I’m looking at you, Zala!!! As with any chat, the beginning few minutes (or so) are dedicated to saying hello, introductions for noobs, getting reacquainted with online friends, and gossiping about weather, food (a VERY common side chat topic! ), and whatever other chatty tidbits we find interesting. Then, it’s time to get down to business and share some knowledge. Let the chatting begin! Again, as I mentioned, I’ve been “doing SEO” for a long time, and one of the aspects of optimization I think gets overlooked as important is inter-linking pages on your own website. But, why are internal links important? It seems obvious, but what makes the Internet, well, the Internet is all of the links between the websites upon it. It’s the connections between related content that drives searches, information, data sharing and so much more! …as Jeff well knows. 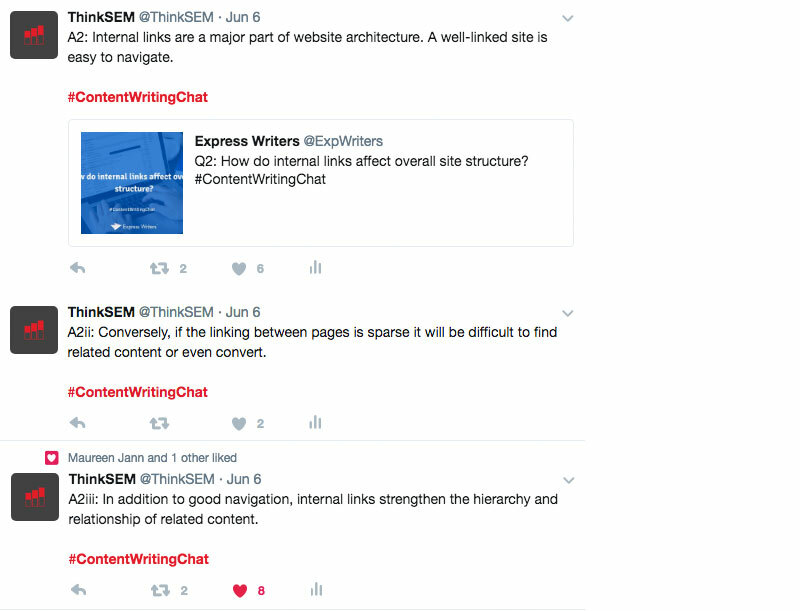 You can use internal links to show the hierarchy of your own site’s content — what’s most important, where you want people to go, etc. And of course spiders like to see connections between related content, too. …while the opposite is also true. Whether you believe in domain and page authority or not, they exist and you can actually influence individual pages’ authority by the way you link between them. Can’t stress it enough: the use of smart internal linking is paramount to your website’s structure. Varun well knows the value of “link juice” and how it adds value throughout your website. On to the next question! Some of the chatters already touched on this in their answers to the first question, but here we’ll delve into it in more detail. Again, a site with good internal links is easy to navigate for your users (which search engines DEFINITELY like); and for every light there is a dark. 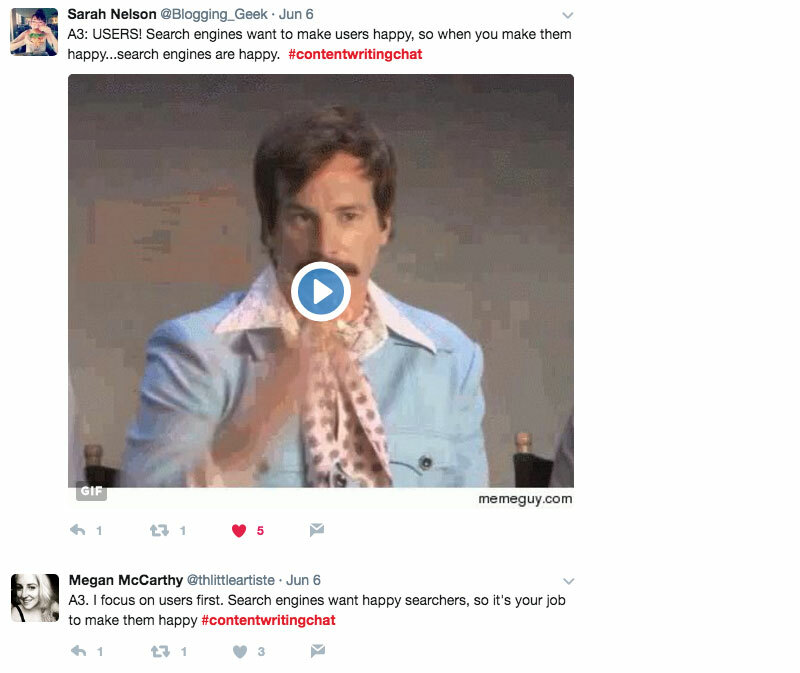 If you don’t inter-link related content or offer your users intuitive navigation, they’re unlikely to find what they’re looking for — much less convert! For heaven’s sake, don’t make your users THINK if you don’t have to — lead them where you want them to go with strategically placed internal links. Don’t forget: internal linking doesn’t just refer to the links within the body copy of a website! An internal link is ANY link between pages of a website — this includes the navigation, naturally. And navigation is your biggest opportunity to offer users access to all of your content. 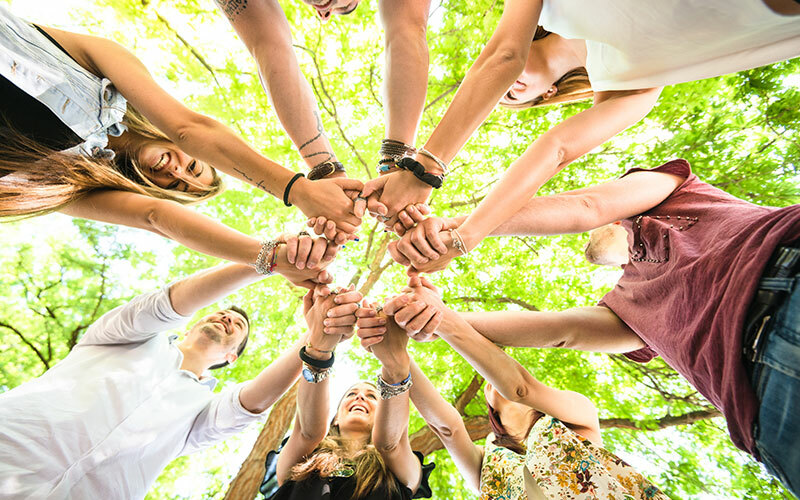 Especially in this day and age, website users expect to be catered to, so link up and make them happy. It’s a very common analogy to say that your navigation is akin to the studs in your home — it holds the entire house together and makes it sturdy. Since we’ve already touched on users and search engines, here’s the next question. 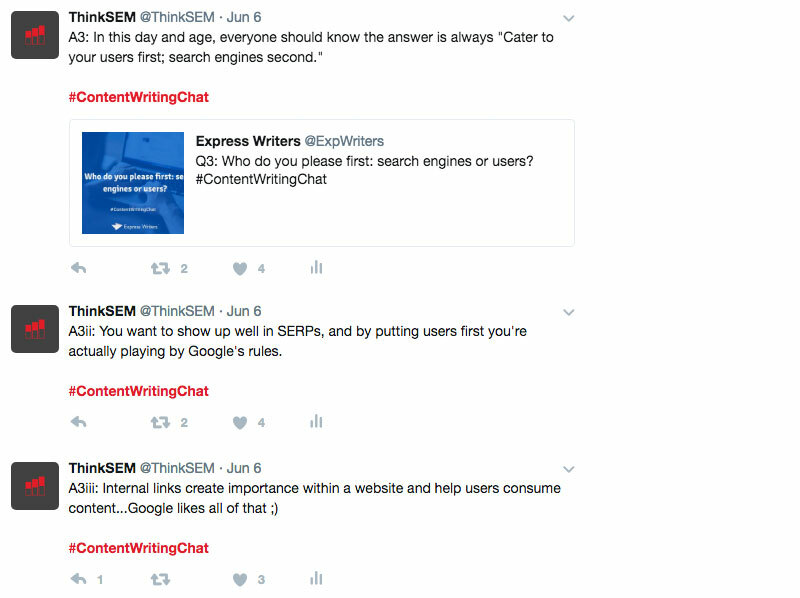 Q3: Whom do you please first: search engines or users? If you’ve been in the SEO world for any length of time, you know the answer USED to be “search engines,” but that’s no longer the case. Since search engines like to emulate human behavior when they’re crawling the Internet, it stands to reason they like websites that cater to humans. Such is life — so please your users, and ipso facto you’ll then please the search engines, too. It would seem the majority of today’s chatters agree: put your website users first when considering internal linking! But, here comes Varun with another smart answer. He says pleasing your website visitors and the search engines is interlinked (<– see what he did there???). Why? It all falls back to search engines liking websites that put the user first. And when users are put first, it makes them happy. And when they’re happy, search engines are happy. So, make everyone happy. O, what’s in a link? 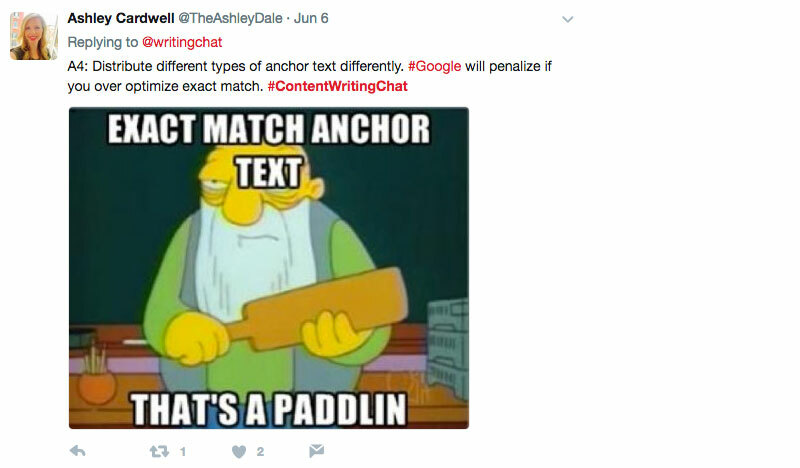 Before we get into answering this question, there were a few inquiries as to what “anchor text” is. Put simply, the words used in a hyperlink make up the anchor text of that link. I.e., the words that are actually linked. The long and short of anchor text is this: don’t over-think it. Link the word/words that make the most sense to tell the user what kind of page they’ll be landing on if they click this link. 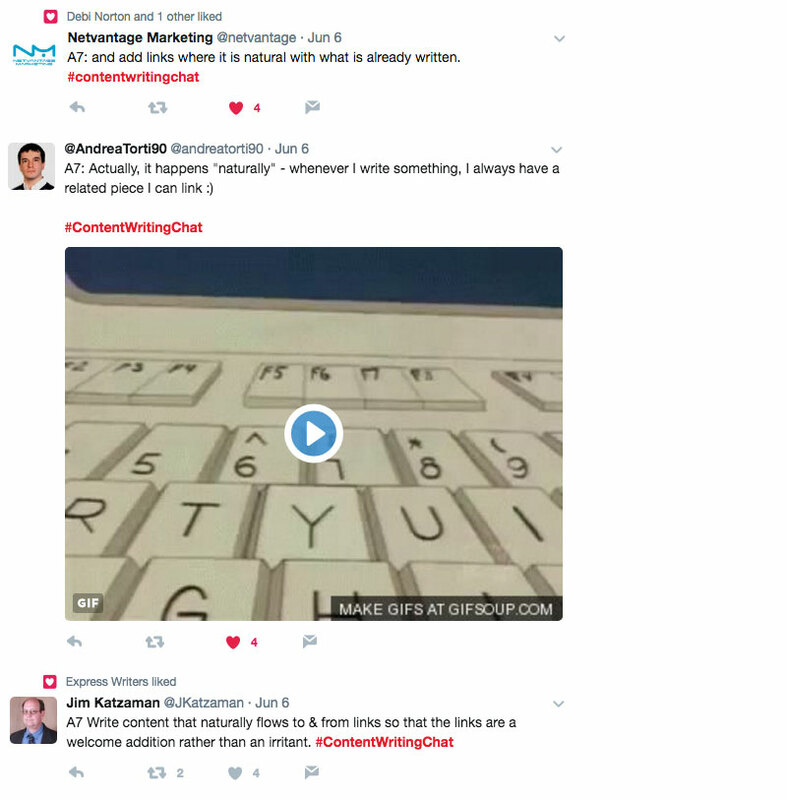 As Netvantage Marketing says, “In a word, YES, anchor text matters.” Okay, maybe more like in 19 words! No worries, Ted — unless you’re a habitual “here” or “read more” type of guy, you’re probably better at anchor text than you think. “Using descriptive anchor text lets people AND search engines know where they’re going.” Folks, it doesn’t get much more beautiful than that. Want to get technical? Well, alrighty. In essence, the anchor text is what we humans see the link as; search engines see that AND the actual page it’s linked to and that can act as “anchor text,” too. 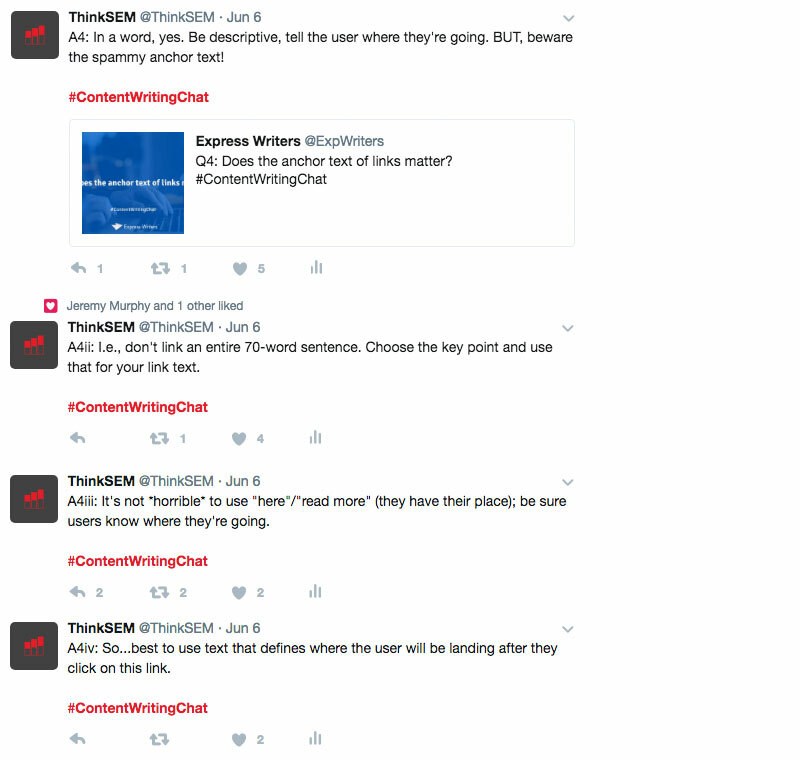 But beware the over-use of the same anchor text to a specific page — it’ll look like you’re trying to game the system to the search engines. Plus, by the way, users can tell it looks spammy, too. 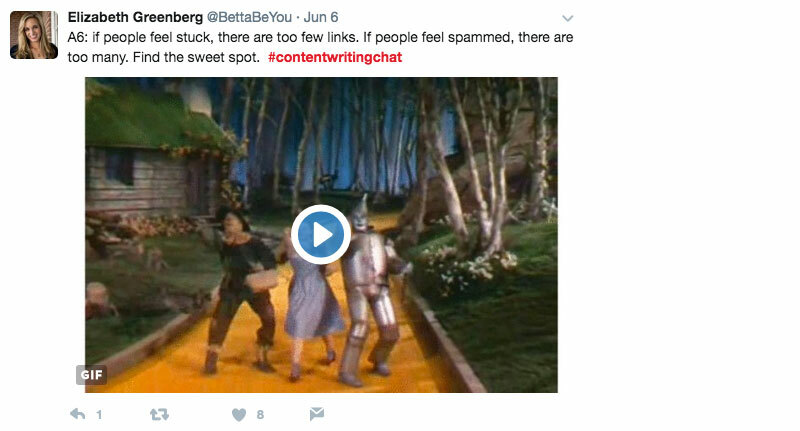 Don’t forget: internal links are ANY links between content on the same domain. And naturally every website has some kind of navigation, and since the nav is *normally* accessible on every page, it means every page listed in said nav is linked to from every page. Think about your user always being able to get back to your home page, for example. This is what I love about this group — they’ve answered this so well! 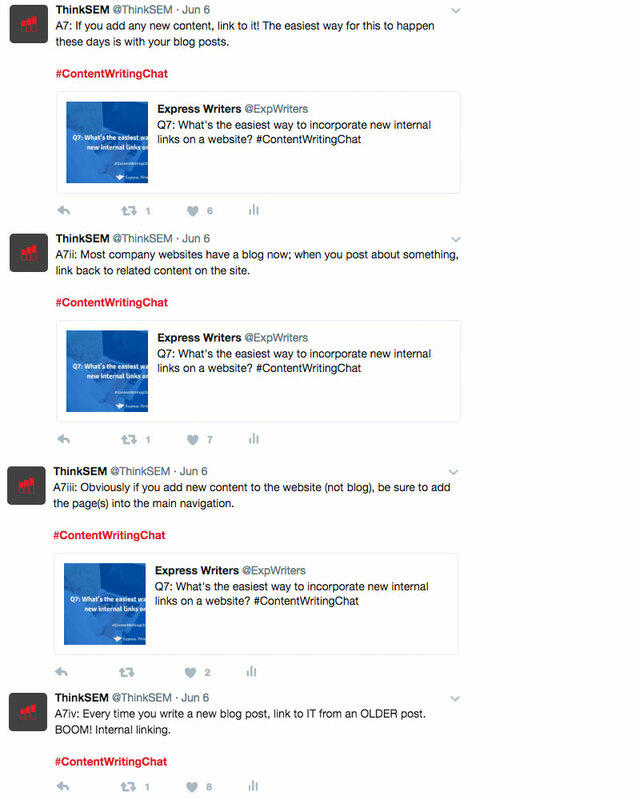 Since we’re all about lead generation here at ThinkSEM, of course we ALWAYS want a call-to-action (CTA) readily available on each and every page of a website to lead visitors to the goal. Again, the main navigation should be easy to see and use, regardless of what kind of website it is. Again, “all roads lead to Rome,” which means on any website you should always be able to get back to the home page. Depending on how long your content is, don’t be afraid to throw a couple of internal links leading to wherever you want your visitors to go. 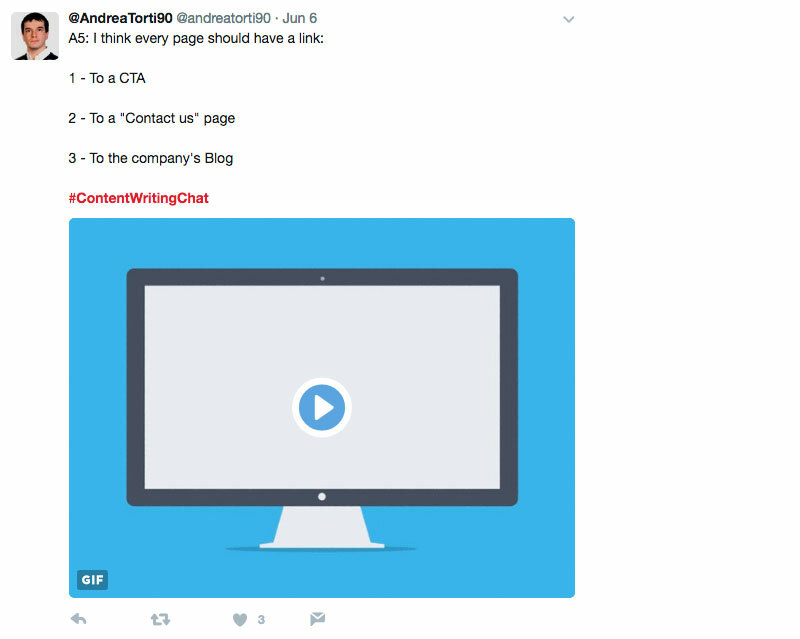 Andrea thinks every web page should have a call-to-action link, a link to the Contact page, and a link to the company blog. I think Andrea knows his stuff. What did we say earlier? A good internal linking strategy would please your users? Well, if they’re pleased they’ll stick around, right? And if they’re not? Well, they’ll hit that dreaded “back” button. 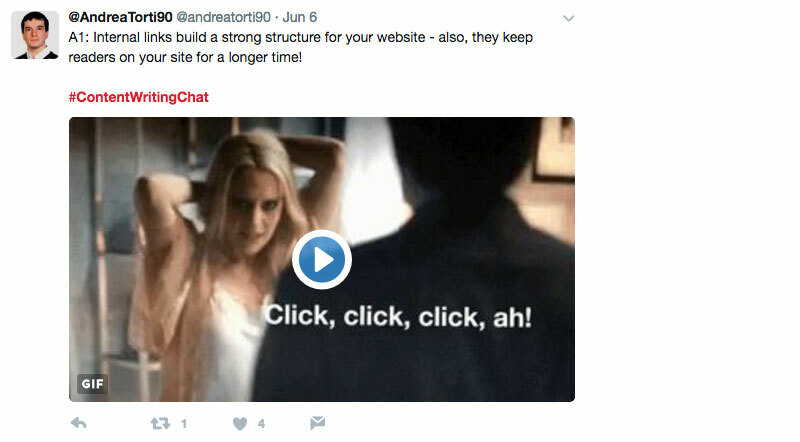 It might seem old-school, but this is one linking strategy that’ll always hold true: always offer users a link to the home page, whether they came in on it or not, everyone wants to see it. 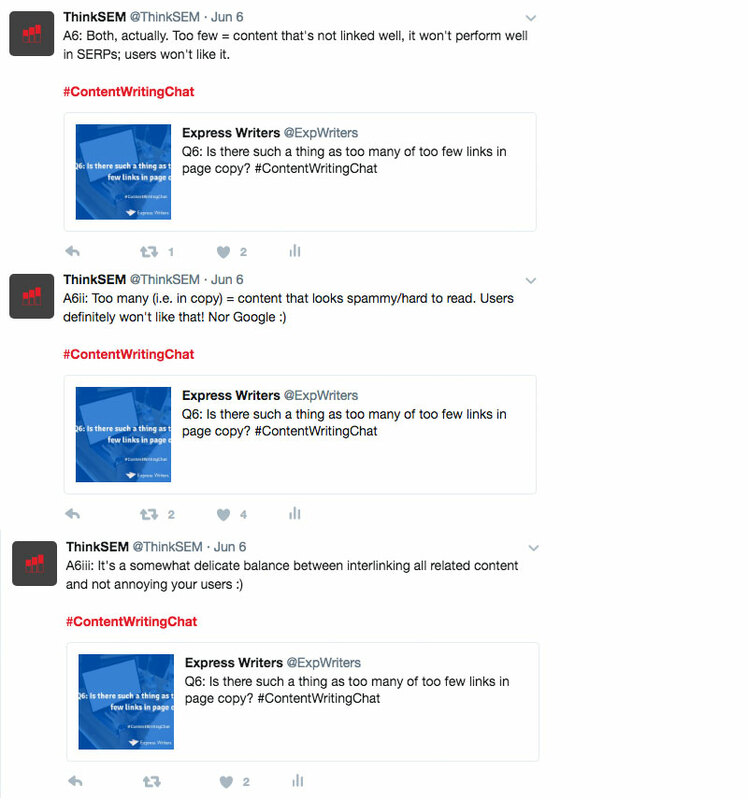 At this point, we’ve talked about quality internal links, but what about quantity? 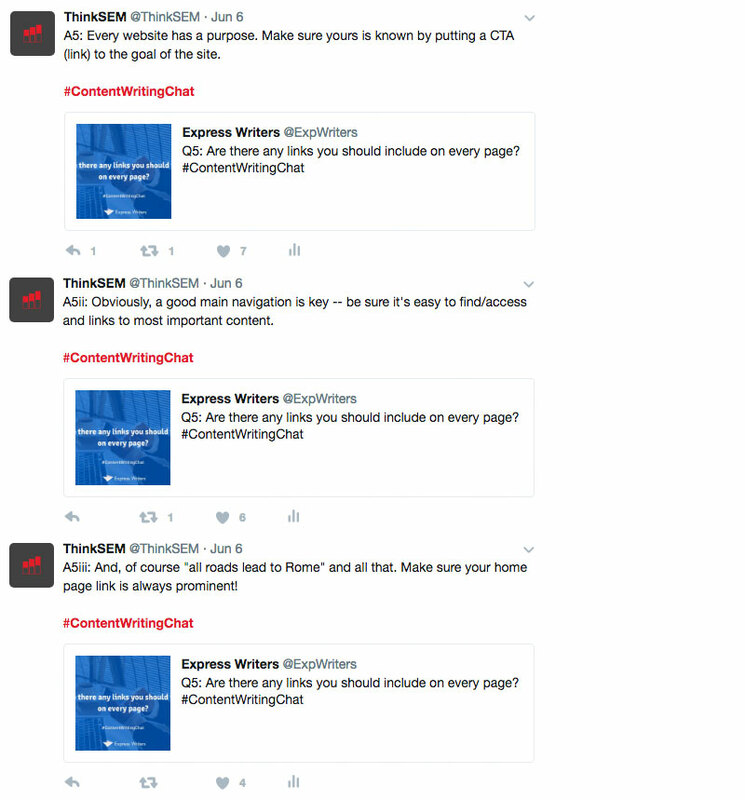 Q6: Is there such a thing as too many or too few links in the page copy? It stands to reason that if inter-linking related content is important, it can be overdone. Or can it? 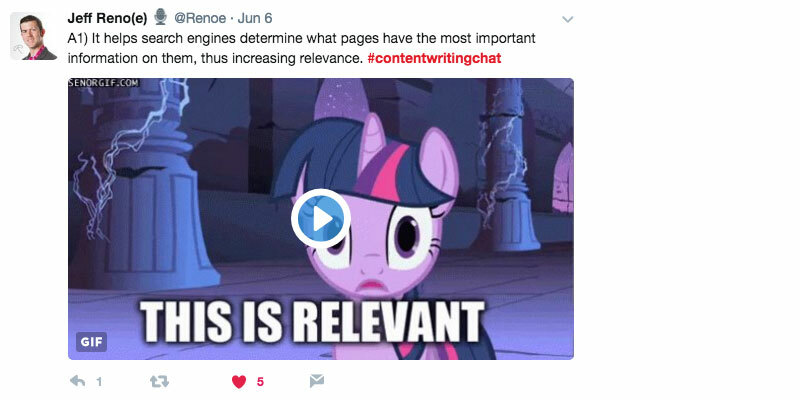 While it’s not an exact science (kind of like the number of keywords on a page, which some people still worry about), it’s a balance between linking content so it’s a useful experience and linking just to link. Be careful you don’t under- OR over-link. Even if you’re trying to sell something, no one wants to see you getting desperate. Too many links in the copy looks just like a salesman grasping at straws. …and there isn’t a “too many” number, but think about what’ll benefit the user. And, while the Google Penguin algorithm update deals with bad links/link schemes/link farms, etc., it really doesn’t look at internal links. That said, if your internal linking strategy looks spammy to humans, for sure it’ll look that way to Google, too, and they won’t like it. 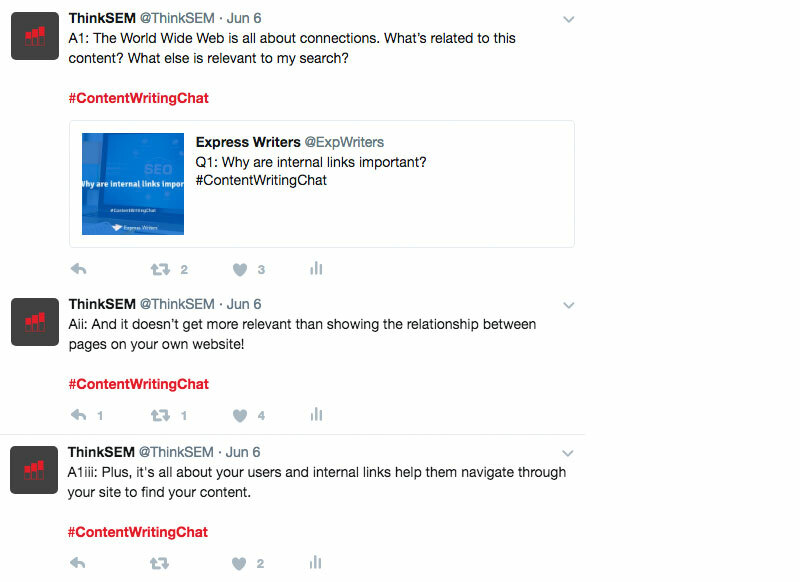 Q7: What’s the easiest way to incorporate new internal links on a website? All this talk of internal links, but no word about how to add new ones once the website is up and running. Simple! Did you create a new website page? Better make sure to add it to the navigation, sitemap, etc. And don’t forget the company blog is a fantastic place to incorporate new links. Every time you write a new blog post, link to it from an old one! 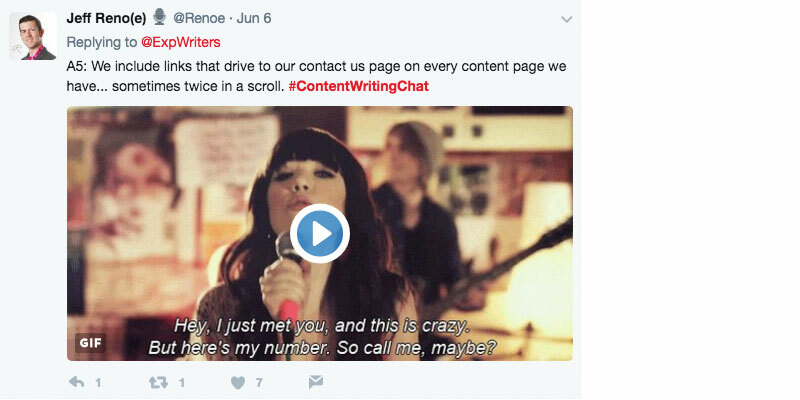 This is a great point: you want to continually update older content and check it for linking opportunities to the newer content you’ve just written. But keep it natural, folks. Don’t just shove some links into your writing — make sure it makes sense and goes with the flow of ideas. To every good, there’s a bad, so let’s see it! While I didn’t want to specifically call anyone out, I wanted to hear the horror stories. Who doesn’t love those? …and use “here” for all anchor text. ICK! While any one transgression can be overlooked, when you compile them it makes it all the worse: like using cruddy anchor text AND over-linking to one certain page AND abusing your linking privileges. If your website is a garden, you need to keep it nicely trimmed, and you can start with all those footnote-y internal links you’ve jammed into the content. Are your internal links bringing zero value to your website users? Better clear your calendar and change that. The worst? Thinking you have to add an internal link every x number of words/sentences. Bleck! …Zachary just gave me music for my eyes: “Track how often links are clicked. That will tell you what interest your audience has.” How brilliant! Let’s check the analytics to see how your users are interacting with your internal links! Love it! 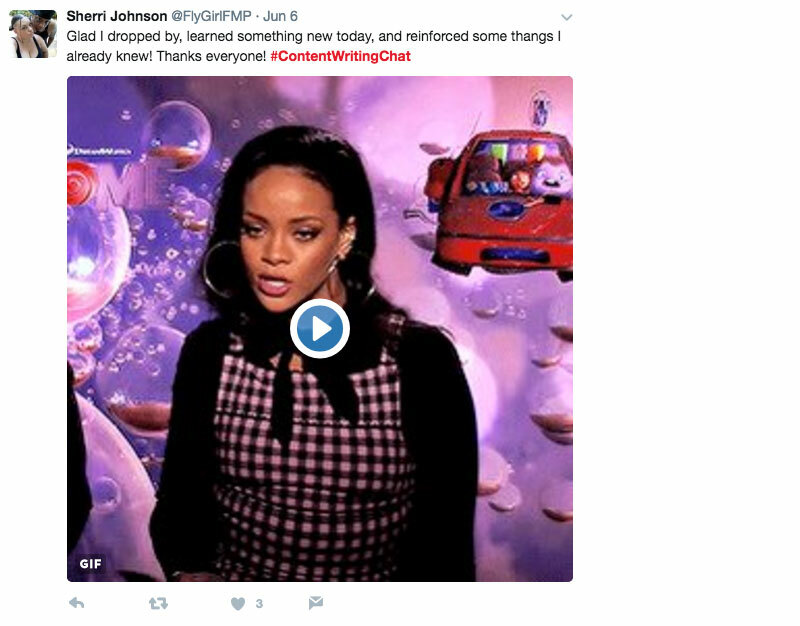 …and #ContentWritingChat is no exception. But, I had a FANTASTIC time guest host(ess)ing, and feel very fortunate to be part of such a great online community. Thanks to all participants — old and new — and as always, keep being awesome. Best of both worlds, Sherri! Of course, you can read Express Writer’s recap of this very same chat here (ha, couldn’t help it!). Until we meet again, keep up the good linking.